October brings cooler weather, and that means it's time to plant garlic. We love the stuff, and use it in our cooking every day. Which means we need to plant a lot of it! There are many varieties of garlic, broken down into two subspecies: hardneck and softneck. Hardneck garlic has a stiff stalk that emerges out from the narrow tip of the bulb and becomes the tall green scallion-like plant above ground. Some of the varieties we grow here are Music, Romanian Red, Polish Hardneck, and Georgian Crystal. Hardneck garlic is a cook's delight, in that each bulb grows four to five large cloves, which are easy to separate from the stalk and quick to peel. Scapes on the way to market, June 20Softneck garlic has, you guessed it, a softer stalk; these varieties of garlic have many small cloves covered by a silvery thin skin. (We grow Silverwhites and Inchelium Red.) Softnecks last longer in storage, and can be planted mechanically, two reasons why supermarkets carry that type almost exclusively. 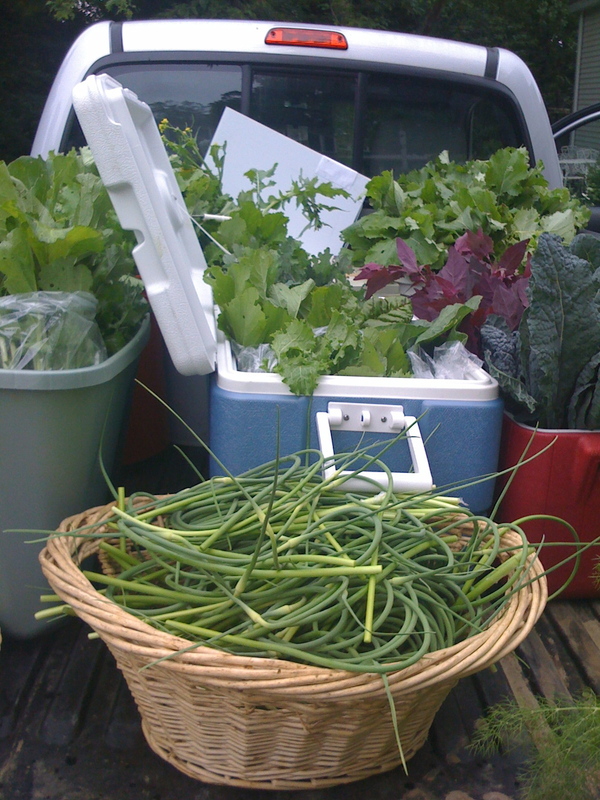 Hardnecks take a little more labor, as they have to planted by hand in a particular way, and their "scapes"--the curly green tops that appear only for a short while in spring, and that taste like garlicky scallions--have to be pulled by hand. 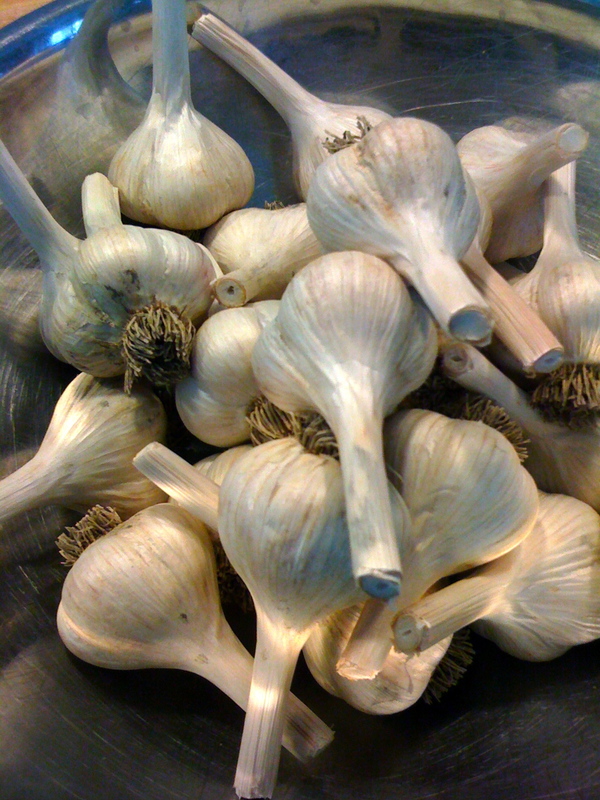 And here's the genius of garlic: you take a bulb of garlic, and break it into its cloves, let's say there are five. Then you plant each of the five cloves in the ground, a few inches deep and six inches apart. Next spring, you'll have five bulbs! It's like magic. So, to plant hardneck garlic: using some kind of implement, dig holes around four-five inches deep and about one-two inches wide; there's a tool for that called a dibble (the wooden tool in the picture to the left). The holes should be about six inches apart. Eight little cloves, ready to sleep for the winterThen you simply place each clove, root end down, in one of the holes. The pointed tip should be about 2 inches from the surface. Finally, tuck the cloves in with some dirt and cover the whole area with mulch. And then you just have to wait until spring.